Ambientação do espaço da artista Caroline Gomes para a exposição Eu, Dafne, que aconteceu na Pinacoteca Municipal de Bauru - Casa Ponce Paz, entre janeiro e fevereiro de 2018. Caroline Gomes e mais 9 artistas foram convidadas pelo projeto Dafnes a interpretar, por meio de suas poéticas, o mito grego de Apolo e Dafne. 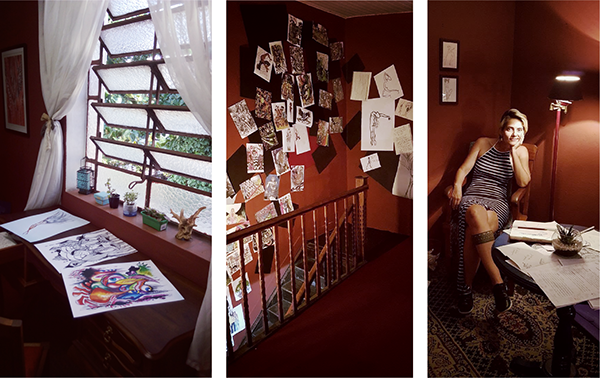 Setting of the artist Caroline Gomes´s space for the exhibition Me, Dafne, which took place at the Pinacoteca Municipal de Bauru - Casa Ponce Paz, between January and February 2018. Caroline Gomes and 9 other artists were invited by the Dafnes project to interpret, through his poetics, the Greek myth of Apollo and Daphne. A artista enfatizou a importância de respeitar as etapas de amadurecimento pessoal que enfrentamos quando nos propomos a criar algo. Desde os primeiros rabiscos tímidos no canto do papel, os testes esquecidos na gaveta, os que "deram errado", os prontos que ficaram feios, todos eles fazem parte do processo de encontrar Dafne, de se encontrar enquanto mulher, criativa, criadora e artista. The artist emphasized the importance of respecting the stages of personal maturity that we face when we set out to create something.The first shy scribbles in the corner of the paper, the forgotten tests in the drawer, the ones that "went wrong," the ready ones that turned ugly, are all part of the process of finding Daphne, of finding herself as a woman, creative, creative, and artist. Como o quarto foi instalado em um mezanino e portanto se fazia necessário subir um lance de escadas, aproveitamos para fazer daquela subida uma espécie de volta no tempo, onde cada degrau que o(a) espectador(a) subisse, poderia ver um pouco mais da relação da artista com o ato de desenhar... Ao todo, foram colados na parede mais de 80 desenhos feitos pela artista entre 2000 e 2008 (dos 10 aos 18 anos). Após subir as escadas, o(a) espectador encontra-se em um quarto com um cantinho de leitura, uma cama, escrivaninha e no fim de tudo, um pequeno espaço elevado com um cavalete. As the room was installed in a mezzanine and therefore it was necessary to climb a flight of stairs, we took advantage to make of that rise a kind of timeline, where each step that the spectator ascended, he could see a little more from the relation of the artist to the act of drawing ... 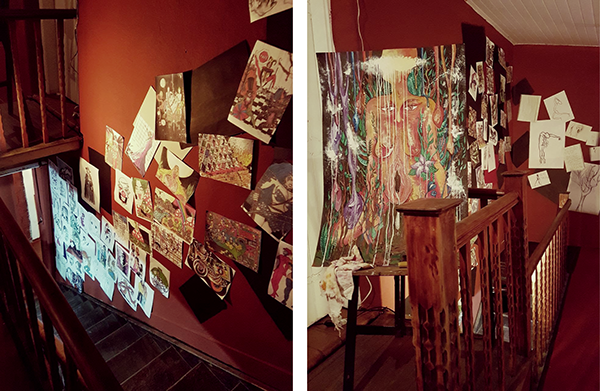 In all, more than 80 drawings made by the artist between 2000 and 2008 (from 10 to 18 years old) were glued to the wall. After climbing the stairs, the spectator is in a room with a reading corner, a bed, writing desk and, after all, a small raised space with an easel. Para ela, nem sempre aqueles trabalhos finalizados e merecedores de moldura são os mais expressivos e verdadeiros. 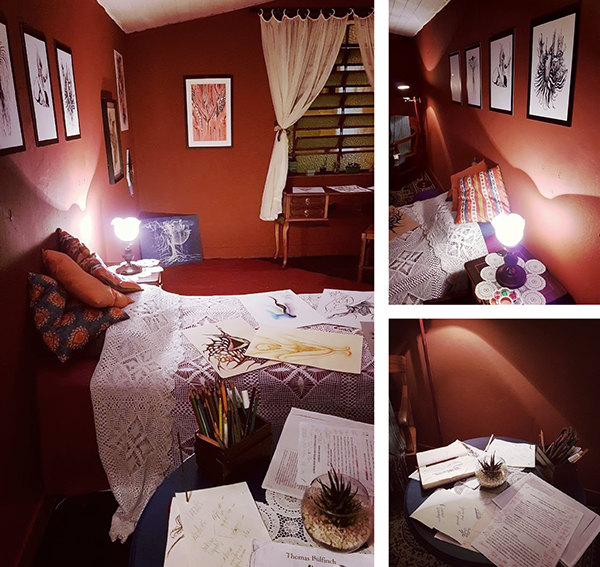 Por conta disso, ao invés de expor todos os seus trabalhos pregados em molduras na parede, optamos por criar um ambiente inspirado em seu quarto, deixando o espaço mais íntimo e acolhedor. Cada um desses espaços foi criado levando em consideração o processo de amadurecimento pessoal da artista. Assim, além de apresentar os trabalhos criados ao longo dos 6 meses do projeto Dafnes, nosso principal objetivo foi proporcionar uma experiência imersiva capaz de levar o/a espectador(a) para dentro do processo criativo e da mente da artista. For her, it is not always those finalized and worthy works of frame that are the most expressive and true. 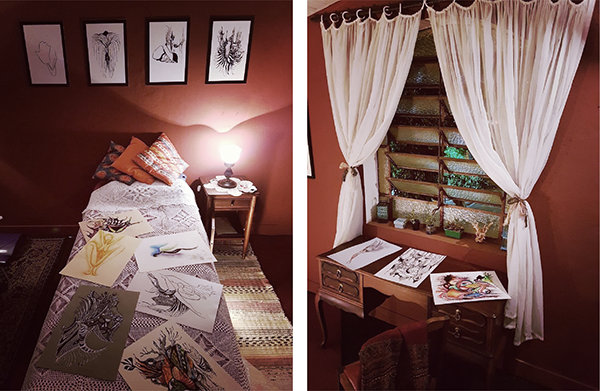 Because of this, instead of exposing all your work nailed to wall frames, we chose to create an environment inspired by her bedroom, leaving the space more intimate and welcoming. Each of these spaces was created taking into consideration the process of personal maturation of the artist. 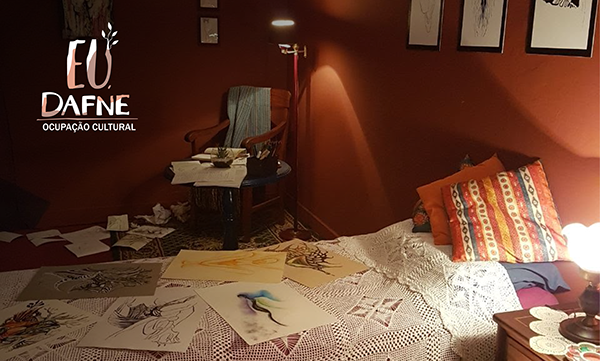 Thus, besides presenting the works created during the 6 months of the Dafnes project, our main objective was to provide an immersive experience capable of taking the viewer into the creative process and the artist's mind.